Join us this July as we celebrate the 50th anniversary of the National Historic Preservation Act through our seventh sojourn into the Devil's Garden and Boles Creek! The Devil's Garden is an expansive, prehistoric lava flow with sparse vegetation, rough, broken basalt, juniper trees, and sage brush flats, in a semi-arid region that covers approximately 500,000 acres of the Modoc National Forest. 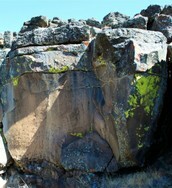 It was home to a variety of prehistoric peoples, evidenced by numerous archaeological sites containing rock rings, rock stacks, and rock art (petroglyphs). For one week this July, PIT volunteers and FS staff will survey and record archaeological sites and features along Boles Creek. This year's data will be added to our mounting collection and, as in years past, will be used to put together a nomination for the area's placement on the National Register of Historic Places (NRHP). So, bring your backpacks and hiking boots, and join us this summer as we hike through the past in The Devil's Garden!